Turn big shaper cutters with confidence. 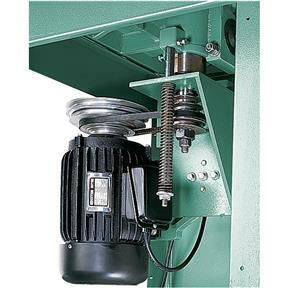 These Professional Shapers handle cutters up to 5-7/8" diameter by 5-1/8" tall and the four speeds let you slow down those big cutters from 10,000 RPM to 3600 RPM. A micro-adjustable split fence lets you dial in for full edge cutting support and spring-steel hold downs increase safety and production. 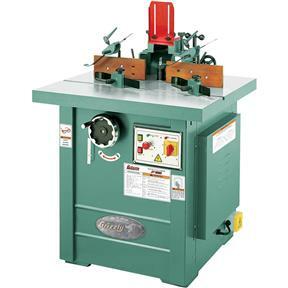 Make one of this Professional Shapers a producer in your shop! 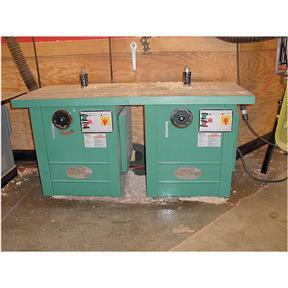 Table size: 35-1/2" x 28"
Spindle sizes: 3/4", 1", and 1-1/4"
Approximate shipping weight: 604 lbs. Wow, I'll say it again, Wow!!! I received my order this last Friday and had a chance Saturday to unpack the machinery and assemble the parts. Whoever designs these machines at your company needs to go to Hawaii for 3 weeks!! They are awesome! 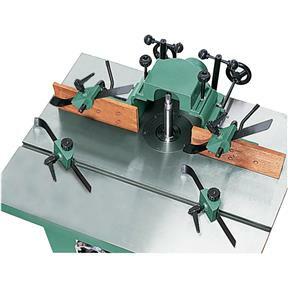 For example, I set up my Extreme Series bandsaw G0513X2 and you guys thought of everything. The trunnion that has a lever action, geared head to precisely angle the table top. 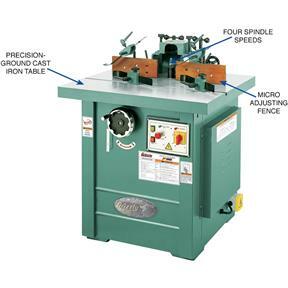 A tall re-saw fence, a miter head that has a pin to slide in to accurately and repeatedly set 0 and 45 degree settings. And the list goes on. Then there was the shaper G5912Z that had all the bells and whistles. Ratcheting setting bolts for the sliding fence, just like your ratchet set of your socket set you have in your tool box! Spring hold downs and 3 spindles. I commend all of you at Grizzly for your well thought out, well designed, and yes mind reading abilities for machinery that is going to make my woodworking life a whole lot easier.